In this article, we’ll try to point out the main factors you need to consider when buying any signed memorabilia. For collectors and true fans, this is very sensible matter. As a collector, you must be very careful since there are many individuals who will forge autographs and try to sell them as genuine. Even if you are buying from sellers with worldwide reputation, there are no guarantees. As an example, we could remember the story about Englishman Alan Sterling. In 2000, he bought the glove from the world-famous auction house Bonhams for £494. The glove was signed by some of the best heavyweights in box history: Muhammad Ali, Joe Frazier, Evander Holyfield, Mike Tyson etc. Soon after, it turned out that all the autographs were fake. This is only one of numerous examples in which collectors were left red handed. Is there a way to be absolutely sure that item you are buying is authentic ? Well, there are few tips that can help you a lot. Most often, these autographs are on mass-produced sports memorabilia items. However, we can find them on other collectibles as well. How to spot this kind of fake autographs? The best way is to to hold it up to a light. If the autograph lights up the same way as the picture, it was printed. Authentic autographs are added later and the ink often shows a purple-grey color when you look at it from the side of the picture. 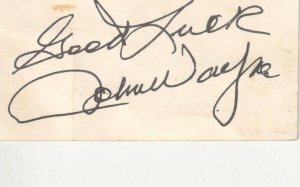 Fine example of pre-printed autograph by John Wayne. 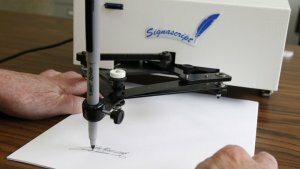 The autopen is actually a machine which uses a mechanical arm to drag a pen along a plastic or metal signature template. Many politicians used autopens in their formal correspondences. For example, Jackie Kennedy relied on autopens to sign her responses to the thousands of condolence letters she received after the death of John Kennedy. Nowadays, autopens can be used to produce various fake autographs, since they create really authentic look. However, there are some important differences that can be spoted under magnifying glass. Lines created by the autopen have the exact same rhythm and thickness, unlike authentic autographs. When you write your own name, you sign it in one continuous movement. Also, the pen is moving before you start writing, as you move it towards the page. On the other hand, autopen comes down with a dot and ends abruptly with another dot. They have machine-like straight lines – especially if these lines are interrupted by accidental “robotic” wobbles, which can reveal where the autopen has slipped. Beware the autopen. This machine is commonly used to produce autographs with authentic look. Always think why and when someone signed the poster, photo or any other item. For example, if If an autograph dated pre-1960s is signed in a felt pen, then it is fake. Felt pens didn’t exist before the 1960s, and it should be signed in ink. Also, think about circumstances. For example, Bobby Fischer’s autograph on invitation for International chess tournament in Portoroz held in 1958 is, safe to say, genuine. Young Bobby signed along with other participants of tournament, which was common habit. Genuine autograph by Bobby Fischer, on the invitation card for International Chess Tournament in Portoroz, held when Bobby was only 15. You can see the traces of ink and uneven, natural lines of pen movement. 5) Which dealer can you trust? Finally, this is one of the most important questions. Earlier, dealers who had authentication services and were members of Universal Autograph Collectors Club (UACC), were safe to trust. However, these services came under a lot of fire in recent year. Also, UACC membership can be bought, so it doesn’t guarantee you anything. What is the safest option? Choose seller who will give you lifetime warranty. Also, look out for prices. If rare and valuable autograph is represented as a bargain, it’s probably fake. I hope that this article was helpful. Stayed tuned for more! Feel free to check our collection of autographs. We offer full life time guarantee. In this article, we'll try to point out the main factors you need to consider when buying any signed memorabilia.